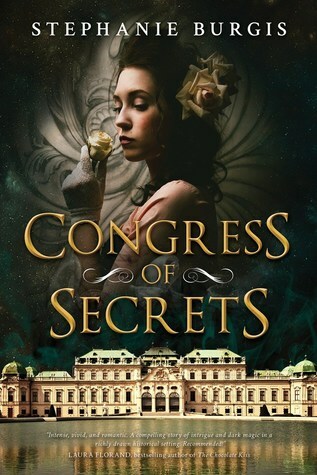 From the author of Masks and Shadows comes this new historical fantasy set to the backdrop of the 1814-1815 Congress of Vienna. From the description, the two books don’t appear to be related, other than the history-meets-fantasy aspect, and the fact that the covers are thematically similar. Speaking of which, good lord that cover is marvelous. “In 1814, the Congress of Vienna has just begun. Diplomats battle over a new map of Europe, actors vie for a chance at glory, and aristocrats and royals from across the continent come together to celebrate the downfall of Napoleon…among them Lady Caroline Wyndham, a wealthy English widow. But Caroline has a secret: she was born Karolina Vogl, daughter of a radical Viennese printer. When her father was arrested by the secret police, Caroline’s childhood was stolen from her by dark alchemy. ← Guest Post: “Creating Crystal Magic” by Laurence MacNaughton + Book & Crystal Giveaway (INT)! That is a gorgeous cover. Hope you love it! Haha, I just learned it was gone because the final cover wasn’t ready to be revealed yet, I’ve put a placeholder for now! I need to check out the other one as well. I am really enjoying books with some historical aspects to them lately so this will fit right in. This. Is. Awesome. I’ve got to get my hands on this when it comes out!! I love historical fantasies. So I’m all for this one. Can’t wait to see what the cover looks like. I didn’t see the “cover to be revealed” at the top and was thinking “Hmm… that’s a… boring… cover choice…” XD The plot doesn’t though!